My teacher is always away. I can never see her when I need to. You are always here to help me out. - Mike B. You break things down and explain things really well. I have had other tutors-but not as good, you are easy to talk to and the time goes by quickly. - Michael T.
He really knows his stuff! (talking to another student) - Bret F.
Hi! 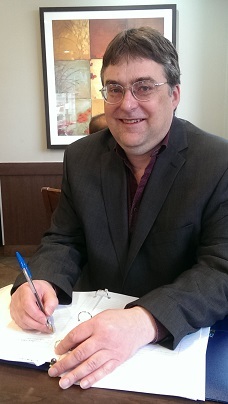 My name is Rob Burchett and I've been tutoring mathematics, chemistry and physics face-to-face in York Region for ten years. I Graduated from the University of Toronto with a degree in Metallurgy and Materials Science Engineering in 1998. Getting much satisfaction from teaching, I am now pursuing a teaching career. I worked for two years for Oxford Learning in Newmarket, Ontario. While working there I discovered I have a natural talent for teaching math and science from grades 6 to 11. Starting my service as an online system to tutor calculus-hence the name "Calc"tutor, it has changed over the years. Graduating from university quite a while ago, I retaught myself the high school curriculum in math and science and then volunteered as a tutor for a while before doing it as paid work. I have worked for a few tutoring companies including two years at Oxford Learning and one year at Grade Learning. I took on the challenge of starting my own company and have grown over the years into the best service I could be. My blog, in the news and updates tag, shows how my business has grown and the success I have had with many students. I also use my blog to enter work on some mathematics I invented. I get some help with this from time to time from a Professor from the University of Chicago. I also use my weblog to post artwork. These are sketches of famous people or ordinary people I have taken from photographs or drawn from real life. I also post some creative writing. These are selected journal entries in which I use a form of writing which I invented and find helpful for self-improvement. I have used this form of writing to help myself and I feel it could be helpful for others to read as the writings can be applied generally. I write on subjects such as strength, character, growth, imagination and organization. My experience has taught me that face-to-face instruction in the correct environment is the most effective, stimulating and satisfying teaching and learning experience. I tutor in a library setting or at your home. Usually parents of elementary or secondary school students or adult learners will contact me by phone or email. We will work out a time and place for a first meeting. Meeting at a library which is close to both of us is preferred. I have a car but would prefer to meet somewhere in York region. At that time I will give you my cell phone number so that you can contact me anytime. Price is discussed. I have listed what I usually charge in the pricing tab. I would like to know what the student is currently studying and if there are any tests coming up in the near future. I will try to see you as soon as possible. Any further information I can provide at this time such as references from parents, students, etc., I will be happy to provide. Plans are all worked out on an individual basis in consideration of the curriculum and immediate student needs.